Please join the AmeriCorps for a community service event in honor of MLK Jr. Day! We will be pulling invasive species of Himalayan blackberry and English ivy. Share that you're going with your friends using the Facebook event HERE! 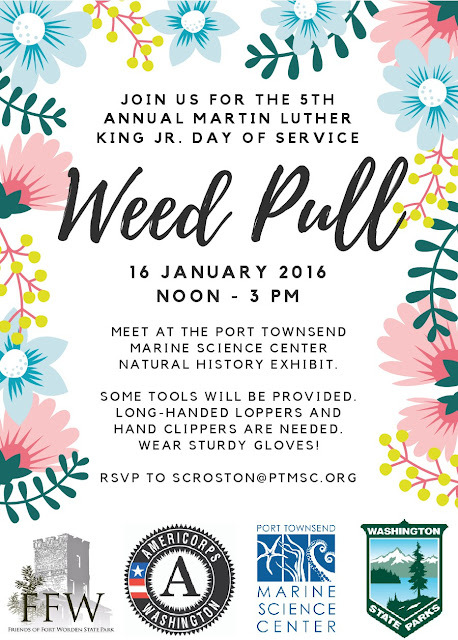 Port Townsend, WA, December 31, 2016—The Port Townsend Marine Science Center is inviting participants to cruise with them to Protection Island aboard one of Puget Sound Express’ heated, fully enclosed whale-watching boats with 360-degree windows, wrap-around observation decks, and a cozy interior. The sail will take place on Saturday, December 31st from 1-4 pm, leaving from the dock at the end of Water Street in Port Townsend and setting off on a 3-hour adventure. Port Townsend Marine Science Center Naturalist, Roger Risley, will be onboard to assist in wildlife spotting and interpretation, accompanied by informative Port Townsend Marine Science Center hosts. A staple of the science center’s seasonal offerings, the New Year’s Eve cruise is wildly popular among tourists and locals alike. Participants enjoy a leisurely tour of the wildlife sanctuary and the enlightening comments from the onboard naturalist. In addition to experiencing and learning about the local marine life, participants have also gotten to witness a variety of birds while taking the cruise including loon, grebe, cormorant, merganser, duck, scoter, phalarope, tern, and puffin, just to name a few. The New Year’s Eve cruise departs at 1 pm on December 31 from the dock opposite the Puget Sound Express offices at the east end of Water Street in Port Townsend and returns to the dock at 4 pm. Tickets for the Protection Island New Year’s Cruise are $80 per person or $60 for members of PTMSC, Audubon, Burke Museum, or Washington Ornithological Society. For more information on the New Year’s Eve Cruise, or to reserve your spot here or call (360) 385-5288. 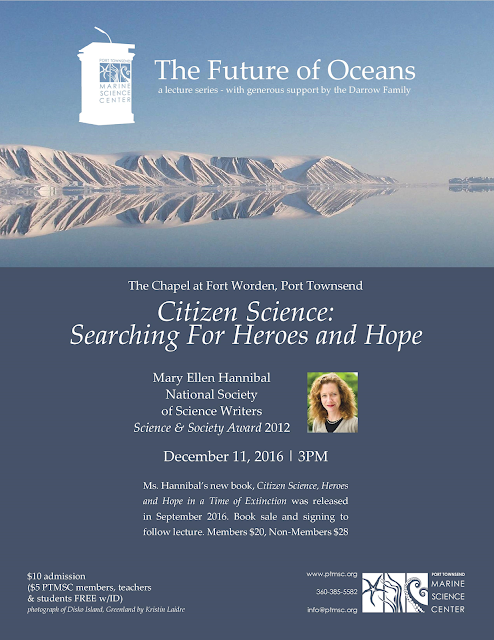 The Port Townsend Marine Science Center is inspiring conservation of the Salish Sea. A new initiative—Gone Green? Go Blue! Support Your Local Ocean—encourages collective action and civic engagement. Located on the beach at Fort Worden, the PTMSC offers two public exhibits: the Marine Exhibit and the Natural History Exhibit. The Natural History & Orca exhibit is open Friday through Sunday, 12 to 5 pm. Admission is $5 for adults, $3 for youth, and free to PTMSC members. The PTMSC also offers a wide variety of educational programs and special events. For more information, call 360.385.5582, e-mail info@ptmsc.org or visit www.ptmsc.org/events. When I arrived at the Port Townsend Marine Science Center (PTMSC) from Texas, I was prepared to show off my knowledge of marine mammals while learning more about other organisms such as birds and invertebrates. Little did I know that I frequently made a common slip – “starfish? Don’t you mean sea star?” After decades of confusion, scientists have pushed for a change from starfish to sea star, and nobody told me! If you’re lucky, you can catch me for an easy opportunity to poke fun at this simple transition. I knew these invertebrate animals were named for their trademark five-armed, radial symmetry, and are not fish. More than 2,000 species of colorful sea stars sport five arms, even though some species can have 10, 20, or up to 50 arms. It is also not unusual for a five-armed sea star to have six arms due to abnormal growth. Sea stars are echinoderms, which translates to “spiny skin.” Their living relatives include sea cucumbers, sea urchins, and sand dollars. The PTMSC Marine Exhibit hosts all of these, with short to long spines, and colors ranging from purple, pink, and orange! I had never felt a sea star’s leathery skin before I began working at the Marine Science Center, nor was I aware of how varied the colors can be. They use colors as camouflage in a number of environments, ranging from tide pools to more than 6,000 m below sea level. The sea stars in the Marine Exhibit (ME) are a deep purple, peach, or neon orange, and are within your reach. Sea stars move and flex using a water vascular system. They pump seawater through their body, filling and emptying tiny, suction-cupped tube feet to extend, retract, or even create suction to scale any surface. One leather star (Dermasterias imbricata) even used its tube feet in an effort to help clean their tide pool tank! The tube the star is grasping a gravel tube, which staff and volunteers use to clean the gravel of the tanks, while in the meantime picking out any discarded clam shells from a sea star’s previous feast. Most sea stars also have the amazing ability to consume prey outside their bodies. Using their tube feet, they pry open clams or oysters. Then, the upper portion of their stomach (known as the cardiac stomach) emerges from their mouth and oozes inside the shell. The clam’s muscles tire against the strong, hydraulically operated tube feet, and eventually open. The stomach then envelops the prey to digest it, eventually withdrawing back into the body. At this point, the lower, or pyloric, stomach digests whatever is remaining. Sea stars are famous for their ability to regrow limbs and entire bodies. This feat is possible by housing most or all of their vital organs in their arms. Rarely, the “central body disc must be intact to regenerate, but a few species can grow an entirely new sea star just from a portion of a severed limb” (National Geographic, 2016). Sea stars can willingly detach an arm to distract a predator to get away, or in a method of reproduction. There is a spreading epidemic of arms shedding and sea stars dying due to disease (National Geographic, 2016). What factors cause these arms to shed unwillingly? Sea stars have been known to suffer from desiccation, or drying out, resulting in lost limbs. However, even healthy sea stars can suffer from sea star wasting disease. This disease causes rapid tissue degradation in sea stars, resulting in lesions on the arms and the body deflating (referred to as a loss in turgor pressure), giving the sea star a melted appearance. The process happens quickly, fully enveloping a sea star within three days, usually ending in death. The disease can spread between individuals, and has resulted in devastating losses, not only in natural habitats, but in aquariums as well. A few weeks ago, I watched as PTMSC lost its last mottled star to sea star wasting. Over the past few years, over 50% of the sea stars in the Marine Exhibit have succumbed to wasting. PTMSC is taking part in monitoring this devastating process. Sea star wasting can cause large die-offs of these important animals, and although sea stars are slow moving, they are instrumental in maintaining a healthy ecosystem. The health of the ecosystem would crumble without sea stars, making them what is known as a keystone species. Sea stars help keep their tide pool and coastal ecosystems in check. PTMSC citizen science volunteers participate in a quarterly survey on Indian Island, where they monitor plots designed to observe the health of local sea star populations. This year, November survey team, led by fellow AmeriCorps Juhi LaFuente, observed numerous healthy ochre (Pisaster ochraceus), sunflower (Pycnopodia helianthoides), and mottled stars (Evasterias troscheli); these species tend to be the first affected by the virus. This is good news for our scaly friends, as it indicates there may be a shift towards reduced die-offs and a slowly recovering ecosystem. The ecosystem recovery process will take a long time. Activists and citizen scientists are working hard on improving the overall health of the ocean, as even the slightest increase in temperature can wreak havoc on an ecosystem. The Marine Exhibit and Natural History Exhibit have taught me several ways that I can individually reduce my impact and waste output. Living in Port Townsend has illuminated healthier living practices for me, and I have been embraced by an environmentally conscious town. The more I learn about sea star wasting, the more pressing environmental stewardship becomes. When walking on the beach near Fort Worden, I am always on the hunt for Eelgrass (Zostera Marina) to add to our display in the Marine Exhibit. I often find what I’m looking for near the high tide line, in a tangled ball that has been uprooted and washed ashore by the waves. Searching for Eelgrass is like a treasure hunt for me, where each tangled ball I find is a clue that provides me with insight to the wonders that lie beneath the waves. Adding the Eelgrass to the display transforms it even further. The tangled mass I collected on the beach unfurls. Vertically suspended in the water column the blades of Eelgrass sway as the water circulates throughout the tank. The Eelgrass tank illuminated by sunlight. At first glance, this tank appears to be filled with Eelgrass and nothing more. However, upon further examination, what I think is a piece of Eelgrass turns out to be a juvenile Bay Pipefish (Syngnathus leptorhynchus) seeking refuge in the tangle of blades. I begin to notice more and more pairs of eyes peering back at me. Tiny Tadpole Sculpins (Psychrolutes paradoxus) dart back and forth, and eel-like fish, called Gunnels, peak their heads out to survey their surroundings. Along the bottom, Crabs scuttle and a Sea Cucumber slowly grazes in search of food. This underwater meadow is, in fact, teeming with life. disguises itself as a piece of Eelgrass. The Eelgrass display in the Marine Exhibit provides visitors with a glimpse into an important nearshore habitat that often goes unseen beneath the waves. Eelgrass is a flowering marine plant that is widely dispersed throughout the Salish Sea. Found in tidelands and shallow waters, Eelgrass thrives in soft sediment habitats that receive plenty of sunlight. 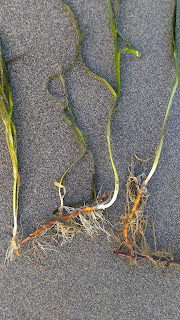 A network of underground stems, called rhizomes, help stabilize the surrounding sediment and anchor the Eelgrass in place. In dense meadows, blades of Eelgrass also help impede current flow and buffers the shoreline from oncoming waves. Many invertebrates and fish depend on and use Eelgrass beds for food and protection from predators. Eelgrass helps ensure the survival of juvenile fish such as Pacific Herring (Clupea pallasii) and Chinook Salmon (Oncorhynchus tshawytscha). These fish are important sources of food for many animals. Chinook salmon are the preferred food of the Southern Resident Orcas (Orcinus orca) residing in the Puget Sound. Found in such close proximity to the shore, eelgrass beds do not go undisturbed by humans. Eelgrass beds in the Puget Sound are threatened by shoreline development, including dredging and the construction of over water structures that block sunlight. Boaters also risk damaging these beds by cutting the grass with their propellers and tearing it up with their anchors. In order to protect Eelgrass habitat, boaters are advised to slow down or stop when cruising over Eelgrass beds and encouraged to avoid anchoring in eelgrass altogether. In an effort to protect Eelgrass beds, the Jefferson County Marine Resources Committee established voluntary “No Anchor Zones” along the Port Townsend Waterfront. These zones are marked by special buoys and protect over 50 acres of Eelgrass in the waters off Port Townsend. Since the installation of these buoys in 2004, the Marine Resources Committee has observed a 98% compliance within these no anchor zones. As the AmeriCorps Marine Exhibit Educator, I enjoy engaging visitors in conversations about our local marine life and important nearshore ecosystems like Eelgrass. Your donations to support the Marine Exhibit help ensure that visitors of all ages will be able to continue to explore, observe and learn about the wonders beneath the waves. The Marine Exhibit plays an integral role in helping us fulfill our mission “Inspiring Conservation of the Salish Sea”, Thank you for making this possible through your continued support. Juhi LaFuente is the Marine Exhibit Educator and an AmeriCorps member serving at the Port Townsend Marine Science Center.